After yet another perfect start to their campaign reflective of their debut ISL season, where they had reached 40 points, the Blues have seemingly taken their foot off the pedal now. They have played four matches since the league has resumed after the international break, winning one, drawing one, and losing twice. However, they are still in no danger of ruining their playoff qualification chances. With three more matches to play and their immediate competitor Mumbai city FC, four points off them, Sunil Chhetri and company wouldn’t be bothered as sealing a playoff berth and now position is their priority. Fourth-placed NorthEast United could get a maximum of 33 points in their next three matches that would cement their playoff place, while Jamshedpur FC and ATK would only reach a maximum of 32 and 29 points respectively. Hence, Bengaluru, sitting at 31, would need one more win to stave all three. But, with their next three fixtures against teams like Jamshedpur FC and FC Goa, who are fighting tooth and nail to seal their own playoff spots, Bengaluru aren’t going to have it easy by any stretch. The Islanders have been the most improved team by far compared to their finish last season as well as their early few displays this season. Under Jorge Costa, the side could easily be credited to have the second most lethal counter attack in the league after Bengaluru. Mumbai’s untimely 1-0 loss to Jamshedpur on Friday last week has surely slowed their momentum and adding one more stop to their journey in sealing a playoff spot, but qualification still looks likely as they need only five more points from remaining three matches remaining. With position holding no real significance in ISL, five more points would see Mumbai reaching 32 points, a threshold fifth-placed Jamshedpur reach at most. Mumbai’s immediate competitor Goa has four matches remaining as they stay adrift of Mumbai by just two points while league leaders Bengaluru lead Mumbai by four points on the other end. However, Mumbai won’t bother going behind Goa and NEUFC as they would still play only one semi-final as per ISL rules. With 25 points already in the bag, the Gaurs are hopeful of playing a second successive playoff in ISL this season. 30 is being considered the safe mark to seal a top four finish, Goa are yet to play ATK, Kerala Blasters, Bengaluru FC, and Chennaiyin FC. With many of the teams getting back their mojo, it certainly isn’t an easy task for Goa. However, with NorthEast, Jamshedpur, and ATK all sitting below Goa, two wins and a draw in their next four matches would suffice Goa a playoff spot. Goa would reach 32 points consequently that would be the maximum that Jamshedpur FC could reach and even then would crash out on goal difference. The Highlanders, on the other hand, have three matches remaining as opposed to Goa’s four and wouldn’t be able to go past 33 points, even if they win all their matches. With the last two results against Bengaluru FC and Delhi Dynamos not going their way, fourth-placed NorthEast United have kept the race for the last two playoff spots wide open. 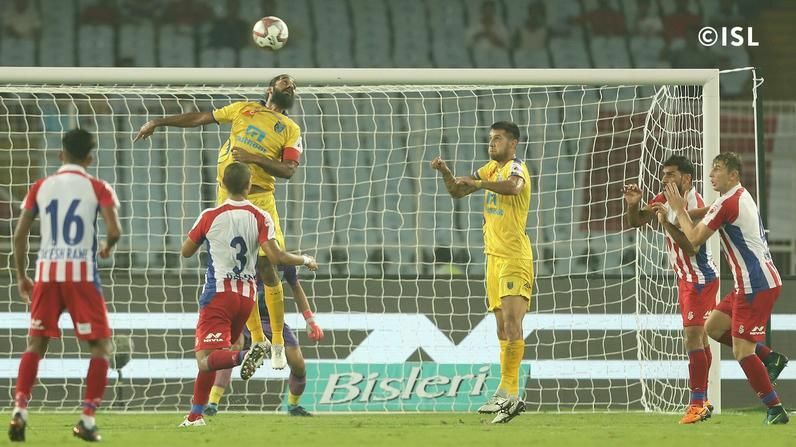 They have three matches remaining against Mumbai City, Pune City, and Kerala Blasters and they could still fancy a third-placed finish if they win all of them, which would see them finish with 33 points. NorthEast’s immediate threat is Jamshedpur, whom Eelco Schattorie’s men don’t play this season anymore. However, with just one point separating the two teams and three matches remaining for them both, the race for the fourth place would go right down to the wire. However, with NorthEast yet to play Mumbai, a resurgent Pune City, and reformative Kerala Blasters, NorthEast’s job is also far from easy. A gritty win over Mumbai City FC saw Jamshedpur coming back to life after a defeat against ATK on the match prior to that. The Steelers would play Pune City, Chhenaiyin FC, and Bengaluru FC and even a win in all three wouldn’t guarantee them a playoff spot. 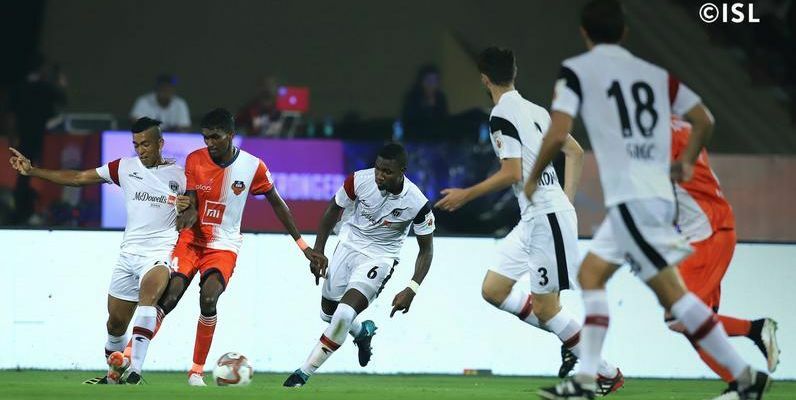 They would reach 32 points at most, a threshold all the current top four sides- NorthEast United, FC Goa, Mumbai and Bengaluru FC would cross if they happen to win all their remaining matches. And the fact that Jamshedpur are left to play only Bengaluru among them, only leaves their qualification to more chance. But, all JFC would need is one falter from NEUFC and Goa and they would be very much back in the fray for qualification. Steve Coppell must be ruing his fortune after an unlikely scorer in Robin Singh prevented the two-time champions from sealing a win away against FC Pune City. With the side running out of games thick and fast, ATK are looking at yet another season with playoffs not in their plans. With 21 points from 15 games, ATK face FC Goa, Mumbai City FC, and Delhi Dynamos in their next three games, where they have to win all and even that wouldn’t guarantee a playoff spot. Jamshedpur, sitting two points above ATK, also have three games remaining and ATK would need the Steelers to falter in at least one of them to bolster their own chances of reaching playoffs. NorthEast United sit three points above ATK and they would also have to lose one match in order for the Kolkata-based franchise to go through. However, all of it would work if ATK win all their games and that is itself a difficult job given their opponents’ form. Phil Brown had emphasized time and again since he was appointed the manager that Pune needed to win all six of their games in order to see any sort of miracles. And with that plan thwarted by ATK in their last game only indicates that they are almost out of contention for playoffs. Winning their next four games would only take Pune to 27 points, something both NEUFC and Jamshedpur would easily cross if they win their remaining games. While the Highlanders need three points to reach 27, the Steelers need four, and ATK need six. Apart from Pune winning all their matches, they would also need Jamshedpur, ATK, and NEUFC to lose all their games to see themselves through. However, it is still possible, if only very narrowly, as Pune play both Jamshedpur and NEUFC in their next four matches. Delhi have finally got going in ISL after a horrible start that saw them getting their first win in as late as December. However, their form has come too late as Josep Gombau’s men sit with just 12 points off 15 games. They play Bengaluru FC, Pune, and ATK next and even nine points won’t be enough to get into the playoff spot as it would take them to 23 points – the threshold that fifth-placed Jamshedpur have already reached. Another forgettable season for Kerala comes to an end as they are trying to undergo massive changes right at the end of the chaotic season. Though Nelo Vingada’s appointment seemed to bring some sort of composure, it has come too late with the yellow brigade very much out of the playoff contention. With only 11 points in the bag, Kerala would, at max, get to a tally of 20 points, something sixth-placed ATK already have. 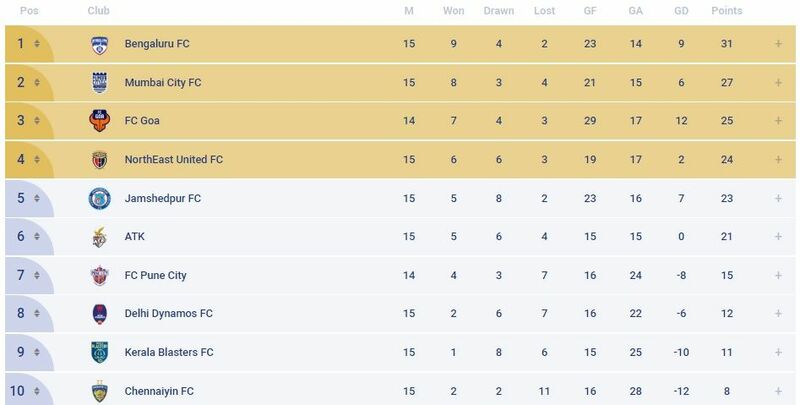 Sitting right at the bottom of the table after bagging eight points off 15 games the Marina Machans, who are also the defending champions, were out of the playoffs even before the playoffs spot. With John Gregory losing complete track of what has gone wrong with his side this time, Chennaiyin are already looking at a remodelling for next season. Though their last win against Bengaluru FC indicates form, they could only reach to a total of 17 points if they win their remaining three matches.